So thought it would be fun to share from time to time where those creative energies have taken me. I will call these posts “Celebrating what I do”. From being the recipient of many beautiful items that I fill my own home with (as well as many others). I get no greater satisfaction than when I get my customer pictures in featuring my items. It’s one thing to see something pretty and buy it, it’s a whole other thing, to dream it, design it, create it and watch it come to life. Took great pleasure in designing my bunny and egg porcelain collection and mine stay out year round!! The tuliperes are one of my most favorite things that I have designed to date and have been so popular, we offer them in three styles, original, village scene (shown here) and solid white. 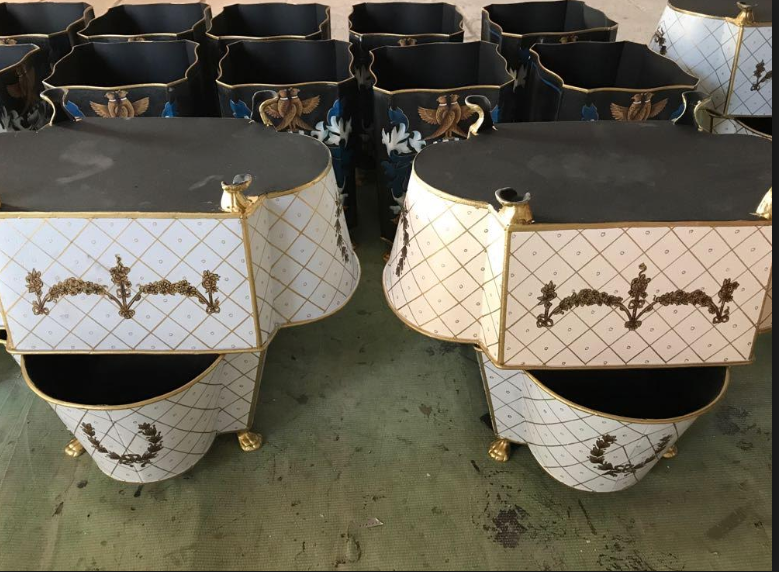 These gorgeous planters on either side, I created off of an antique pair I have owned. for years. We normally can’t keep these in stock, but we just got a bunch in! Just LOVE my mini silver tea lamps and beautiful line of silver including my gorgeous array of elegant silver chargers. Another idea born out of not being able to find it, I had seen them at the Polo Bar (similar) but could not find high quality heavy beautiful lamps…so I created them! 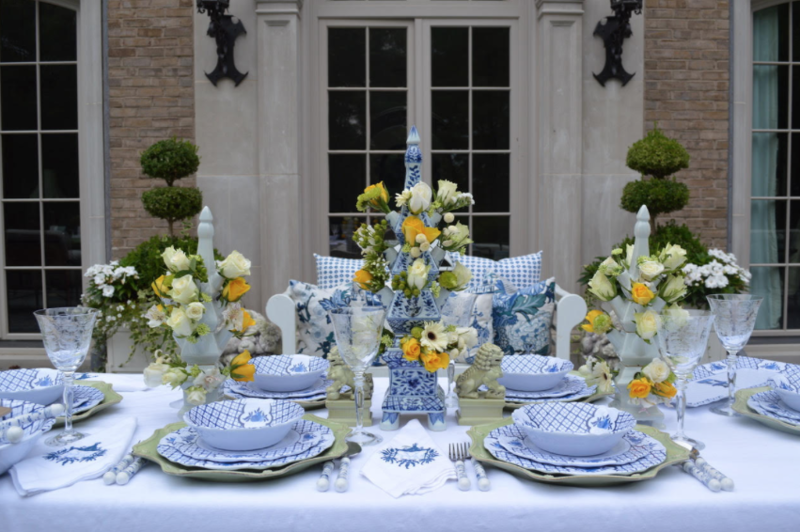 This table setting is one of my all time favorites, love the blue, white and yellow. Featuring the original style melamine and the original as well as solid white topiaries. 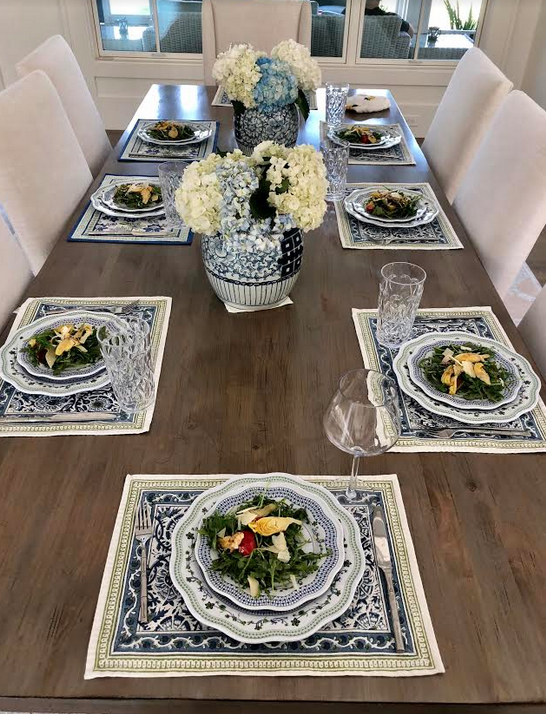 My melamine has been a huge hit, I created sophisticated plates that only look like china but are easy,lightweight, maintenance free and affordable…they can fool almost anyone! Adore this orange, blue and white pagoda melamine set its a new pattern this year and so fabulous! More flower arrangements and of course my gorgeous Stafforshire dogs, which have been super popular, they are a classic! 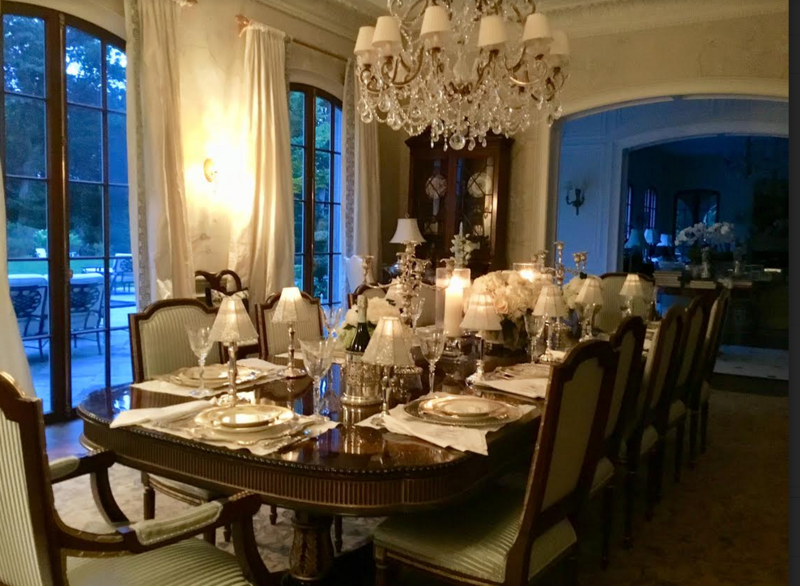 Huge fan of my chinoiserie tole line….can’t get enough and my house proves it! This post has me smiling from ear to ear. Even on weeks where the stress level is higher, this is a happy and beautiful reminder as to why I feel so fortunate to do what I do every single day. Not to mention what a thrill it is for me to know I am helping to beautify homes all over the world (yes we ship from Dubai to Australia). So thank you for encouraging, supporting and loving what I do. I want to offer a little giveaway to one lucky reader. I am also offering 20% off SITE WIDE today only (Friday). Use code “LOVE”. So if you have had your eye on something, today’s your day! Onto the giveaway……. Thank you for stopping by. Wishing everyone a wonderful day and hope it’s filled with something pretty. 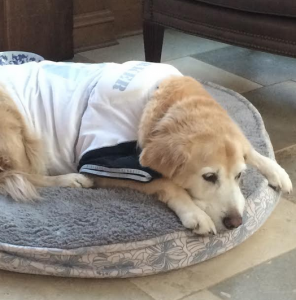 Stay calm, be happy and carry on……..
We are all so grateful that you started this blog and opened your store. It is a tremendous source of inspiration for myself and so many others. What a gift! Speaking of gifts….I have been coveting your incredible Bird Ginger Jar Lamp. It is just amazing. I also love your Mid Size Hex Planters for every season. Keep doing what your doing! We need your inspiration! I really really love the blue and white garden seats. I need a few of them to sprinkle around my patio, for seating and to use as side tables. Love them! 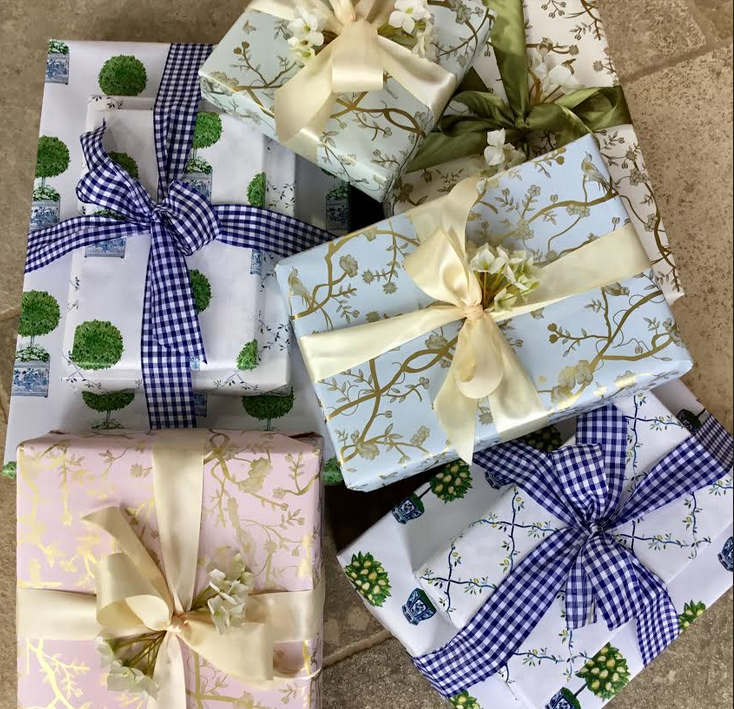 Love, love your topiary gift wrap! I simply love everything. This is a problem since we have recently moved to a smaller home. Only 300 sq. feet smaller, but somehow feels smaller. I had plans to buy so many more porcelain pieces. I am still arranging, but I want more of any of your ginger jars and vases. I am not sure I will ever have enough. The ginger jars with the foo dogs are so beautiful, I have been wanting to find a place for 2 for several years. I love the shape of your “Ralph” vases and think they would be wonderful for my weekly flowers. I am so glad you love what you do, I would be so disappointed without my Enchanted Home fix. I love looking at the photographs for inspiration. Thank you for making my home more beautiful, I smile every time I walk through the house and see my Enchanted home purchases. There isn’t much on your shopping site I don’t love! Have purchased your silver chargers, Ralph Vases, planters, Foo Dogs etc. etc.! Love all the pictures posted! 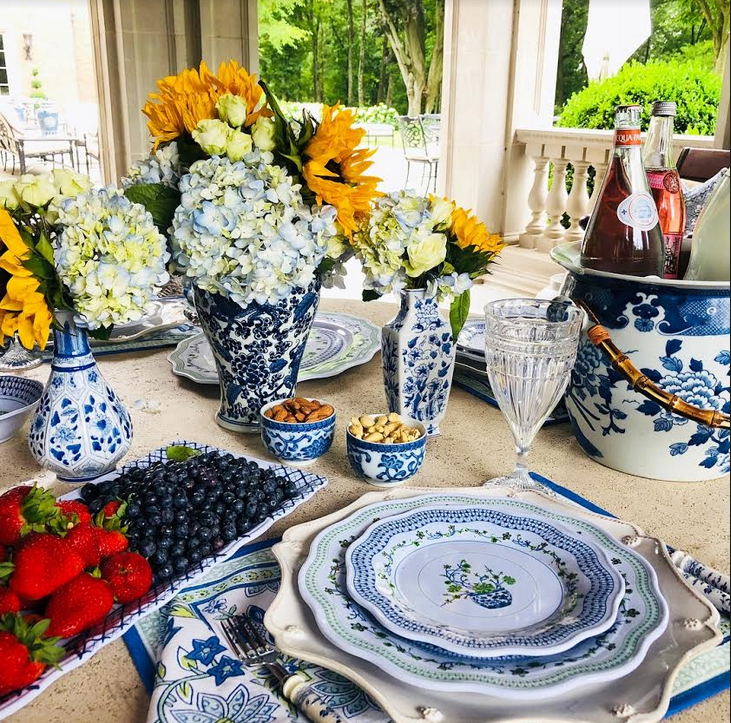 One of my passions is creating beautiful table top vignettes and your offerings showcase one of my favorite color schemes, Blue and White, which was an inherited passion from my Grandmother. Your posts cheer me up everyday I receive them! There are so many pretties that it is hard to pick a couple. However, think I like the wine cooler and the tea canister. Your beautiful items and creations take blue and white to a whole new level of WONDERFUL! I love the midsize dbl. Happiness vase and the 2 foo dogs! 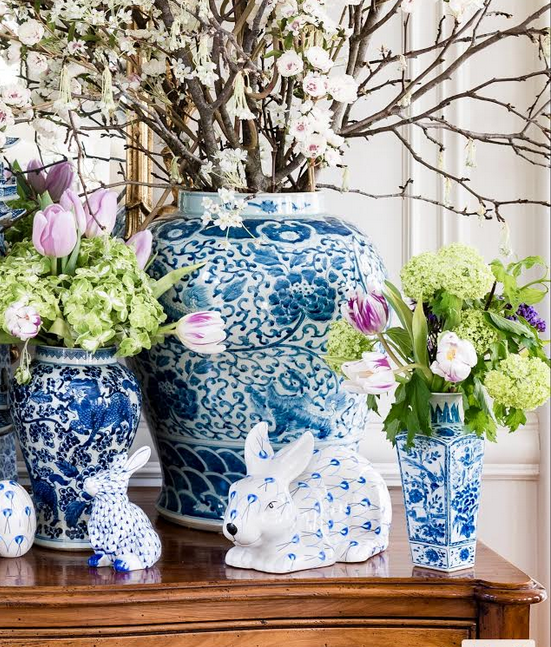 i love the mini blue and white foo dogs! every time i see them it makes me smile. also love the reed flatware. i have to ask myself do i really need another set of flatware, but oh well! Tina, as usual I wait every day for your posts, and I love your new idea of sharing. When viewing your shop, I love everything, how can you just pick one? But I do love your Bell Jars as I have two hanging in my kitchen above my island and love all of the boxwoods and planters. I am a boxwood lover. Have a wonderful day and thank you for always keeping us so happy with your lovely posts and your talent. You are blessed with creativity and drive, Tina. Can’t count the number of people who I have informed about The Enchanted Home and the lovely items from your shop. Keep up the good work. It is a joy to check your post each day. I love the blue and white garden seats! I already follow you in Instagram. Enchanted Home is like a breath of fresh air every time I open it! Thank you Tina. There’s so much eye candy in your shop and gorgeous things that it’s hard to decide! 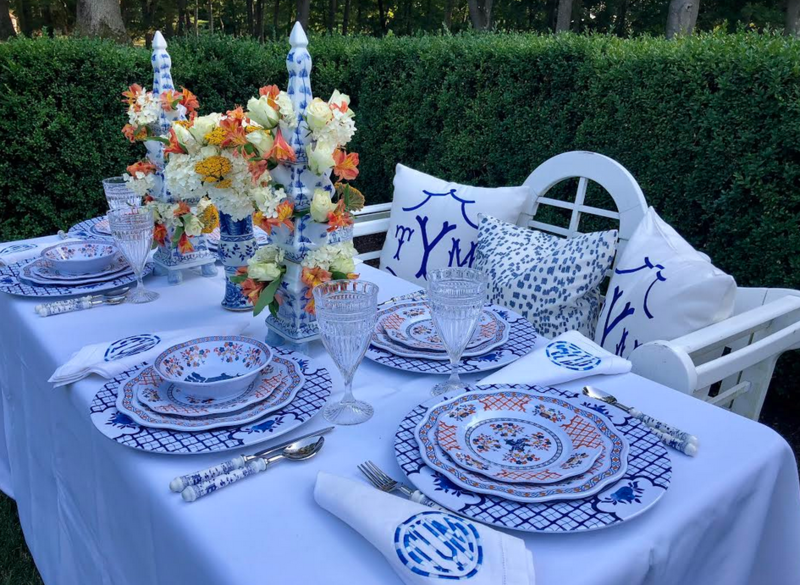 Love, love, love the blue white foo dogs, the blue white melamine and the blue white garden stools!! Guess it’s safe to say just about anything blue/white in your shop!! 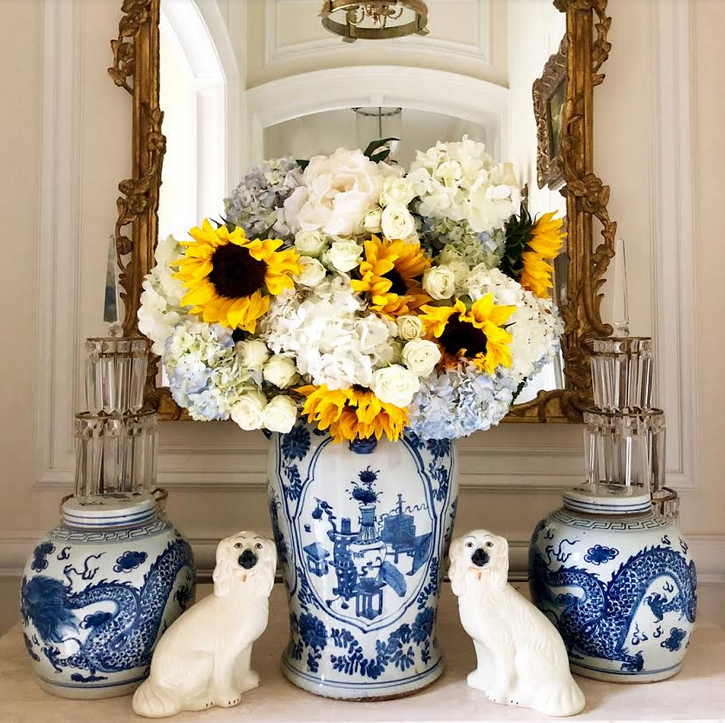 Still love the foo dogs and the beautiful tole planters! I have followed your Blog from the start and you always inspire. 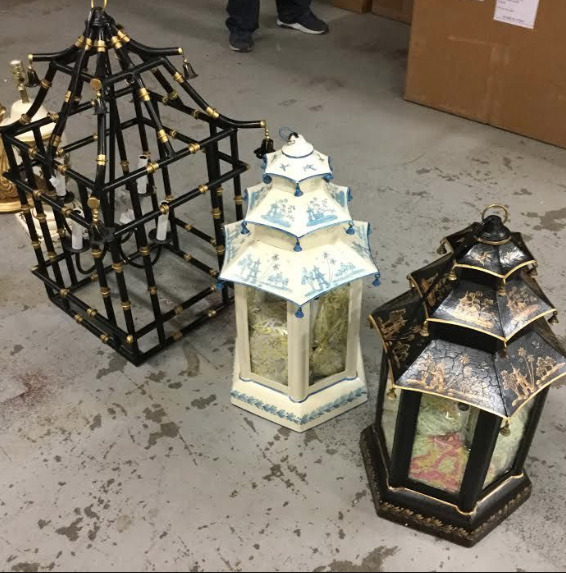 So glad you opened your store so we can purchase these beautiful items for our own homes. Thank you Tina !! I really love all the porcelain. It creates such a classic look to a space. And of course, the foo dogs are gorgeous as well :). Tina, I so look forward to your post each and every day! I have been doing so for 6 years! It has been fun watching your creativity…from designing your main home to your beautiful creations you sell in your shop..to your vacation home. I especially love the boxwood planters, I wish I had more space for them outdoors. Hard to choose a favorite from your shop, all is so beautiful and exquisite!!! 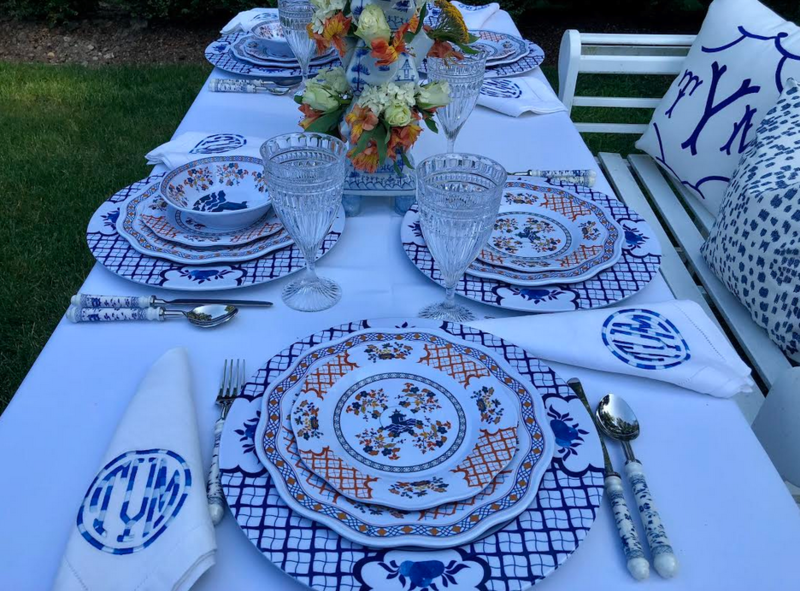 love each and every piece, which you have chosen with great taste, from the jars, melamine, wrapping paper, the linens each and every monogram is so beautifully done..could go on and on! I started following you 6 years ago when I was designing my kitchen and I was searching the Internet for ideas. Your blog was and is filled with beautiful inspiration which influenced my decisions. Your shop is the icing on the cake. Right now, I am deciding on pillows – you have so many wonderful choices! Thank you for the inspiration. Joan R.
I love the cream & diamond rug…I have a perfect spot for it … thank you for all your hard work. It does not go unappreciated. Tina – I’ve followed your blog almost since the beginning and it’s so fun to see you are even more excited today about what you do! I still love your porcelains more than anything. In fact you could say I’m a ginger jar kind of girl. However, right now I’m in love with the fish bowl planters. I just can’t decide which one! Beautiful pictures! 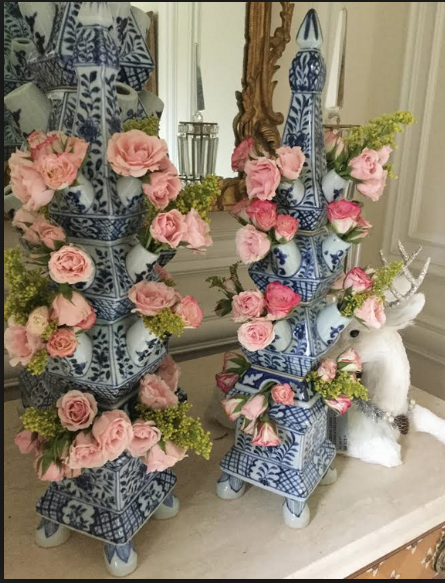 One of my favorite items is the ivory chinoiserie vase. 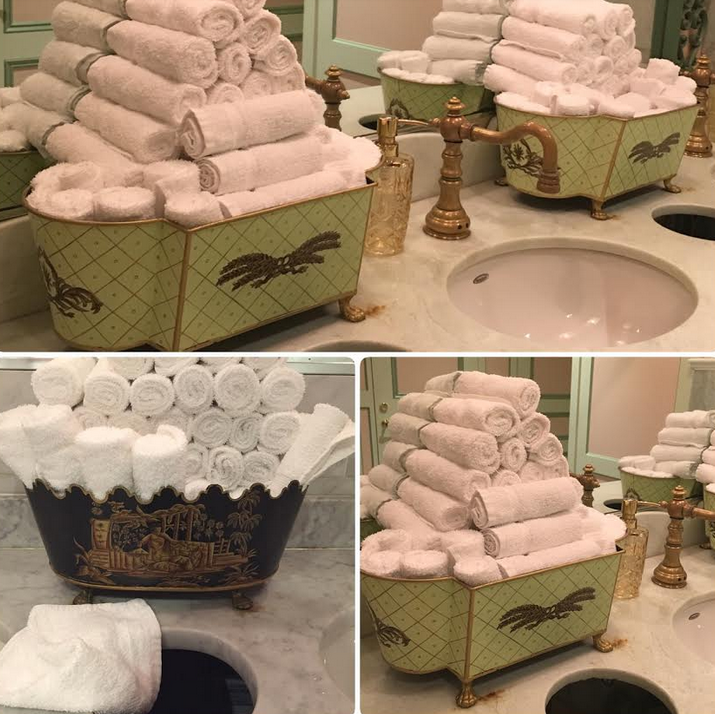 Love the look with folded towels in them for a bath. Beautiful post! I love the pheasant ornaments and the small bud vase. Thank you Tina for inspiring us with your beautiful pictures! I laughed today about your comment regarding the men’s restroom! Well this is a very hard task! I will just take one of each please!! Love your posts!! How do you pick just one thing? I guess the blue and white jars. Also, love you the green leopard pillows. Trying to incorporate some green into my decor. Thanks Tina! Liz K.
Tina, I love every purchase I have made from your shop, and your inspirational photos. 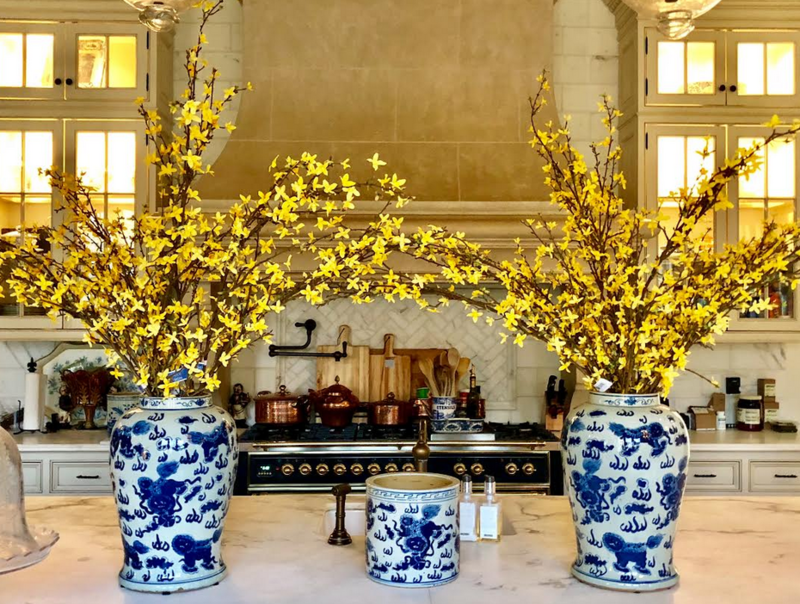 That shot of the chinoiserie planter in Brennan’s caught my eye, and I’d love one in the pale blue and gold. It would be perfect in my guest bathroom. Have a great weekend! Your blog and shop are indeed enchanting. I absolutely crave your dough bowls and bread boards, as well as the big boxwood balls (actually all the boxwood!) and of course I adore your double sided gift wrap paper. I always look forward to your posts, Instagrams, etc. Thank you. Tina, I always get so excited when I see you in my inbox. I love all of your beautiful things …but have my eye on blue and white garden seats. Keep it up! 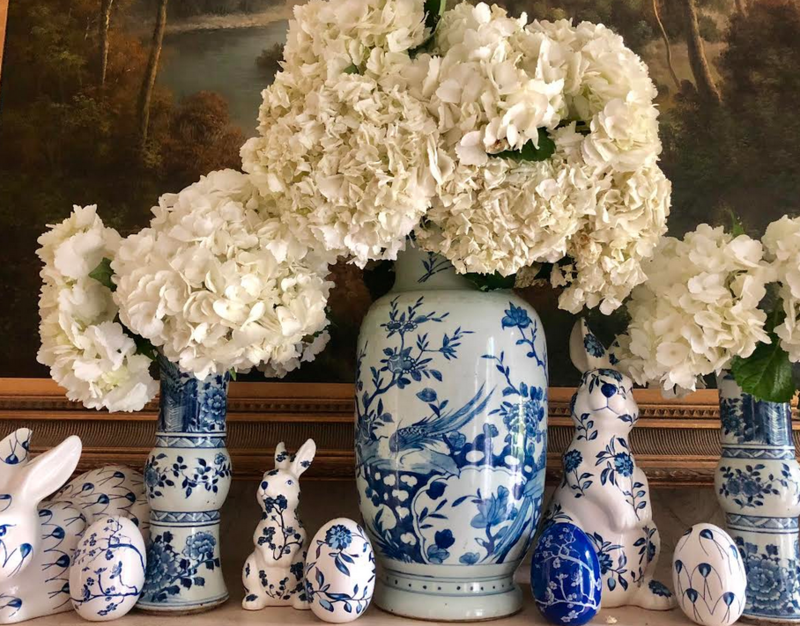 Really, really, love the mini blue and white foo dogs, no one else has these and they are so unique and look great anywhere and all year round……. Well I love everything!! But I really love your blue and white lamps with the gold trim! stunning! 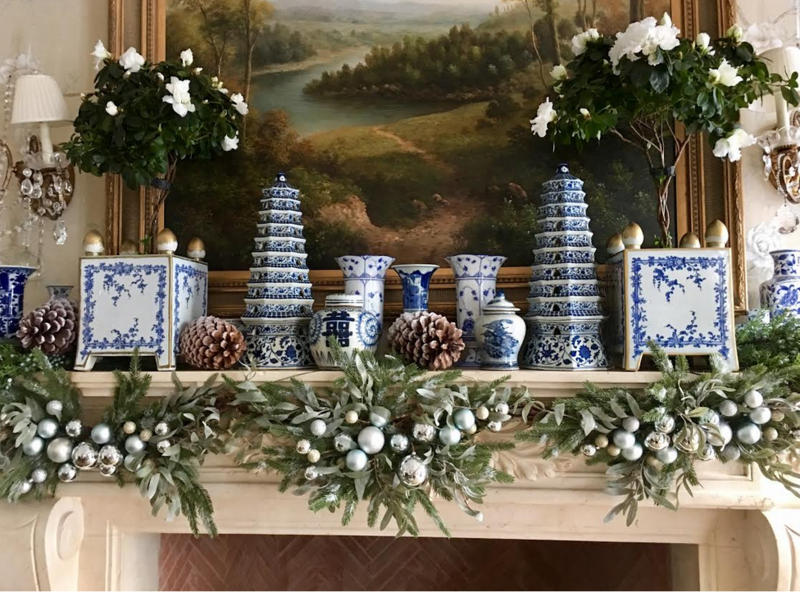 I love the blue and white ornaments. It is never too early to get started on holiday decor. You have a wonderful shop. Absolutely love, love,love everything !! The ginger jars are just beautiful. . And don’t get me started on the melamine dinner Ware. So lovely. Thanks for sharing all the beautiful and inspiring photos. Your shop has so many pretty things that it’s hard to narrow down all the choices. But I would love the custom monogram cocktail napkins! All of your blue and white will forever be a staple. Love love your blue and white ginger jars and garden seats. Thank you for sharing what you do with all of us. You have so many beautiful things. I love my soft pink ginger jar I received a few weeks ago. My next purchase will be the pink needlepoint pillow which is now sold out. Just beautiful! I love blue and white, but also love soft pink. I love your site and all of your inspiration. 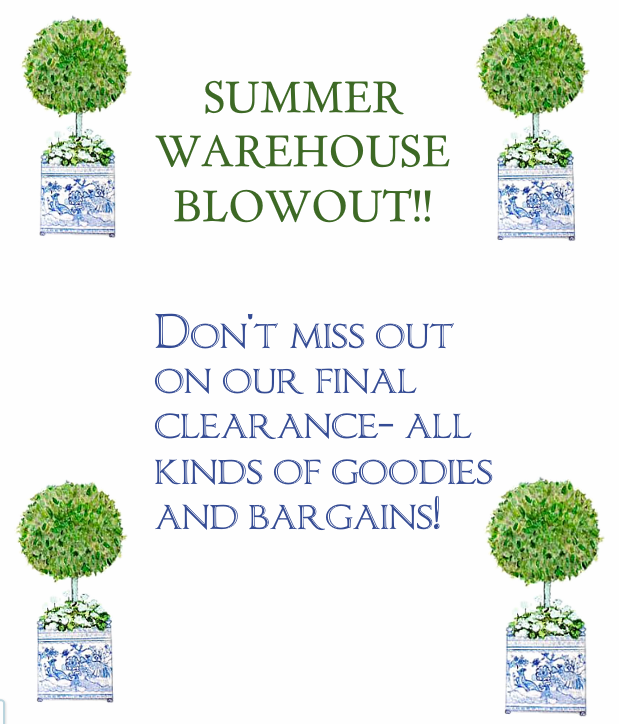 The “Ralph” vases, the garden seats and the melamine are just some of my favorites!! the table isn’t set. They are beautiful and, I agree, silver is timeless and elegant. 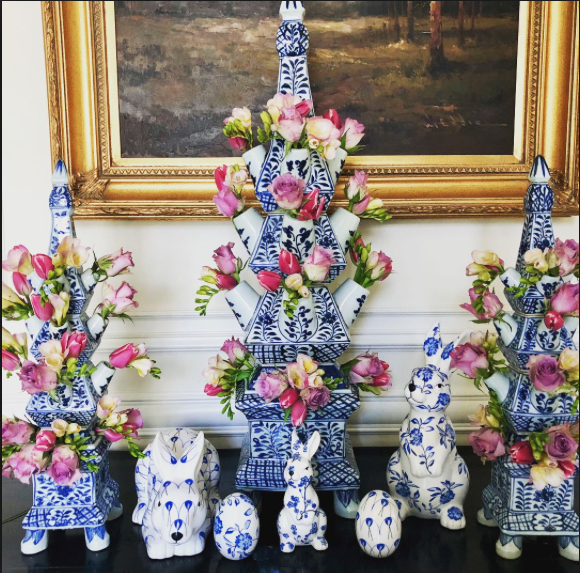 I am obsessed with your chinoiserie Christmas ornaments! I just grabbed a couple more boxes during your sale. I was telling the lovely woman who helped me with my order that believe it or not I am not a Blue and White devotee ( I think Tina, will still love me). My ornaments are green, gold and now, orange! I cannot recommend them highly enough. They quality is excellent and although they look very delicate they have a nice, light weight. This will be my third year displaying the ornaments on my tree. I can hardly wait to receive my new addition. I love all the ginger jars. A mix of those would brighten anything! Tina…your blue and white line is by far the best I’ve ever seen, and I love my purchases from you. I also love the provencal planters and plan to buy a set at some point. One request…I’ve been looking online for a three tiered silver server like the ones used for high tea in hotels. There aren’t many out there (and those are too plain and modern). Maybe that is something you can start carrying. I especially like the ones from England, that are footed and have a pineapple on top where it is carried. Love the garden seat, dishes, wrapping paper and topiary. So many beautiful items. All the garden seats are BEAUTIFUL!!! So happy I came across your blog! Have been following along and made a few purchases! So many beautiful and creative goodies. I am loving the porcelain ice bucket with bamboo handles and the blue/white garden seat with birds right now. Thanks for all the beauty. Regina S.
Tina…every single picture is exquisite!!!! Your accomplishments my dear friend ! I love the original melamine, the monogrammed linens, oversized ginger jars and, well, pretty much all of it….. I have been a blue and white lover for 40 years. Some of my very first purchases as a young married woman were blue and white porcelains. So imagine how excited I was to discover you and your blog a few years ago. Every time is a feast for my eyes and today was out of this world! Congrats Tina for pursuing your dream and making it a reality!! Thank you for the daily smile your site puts on my face. 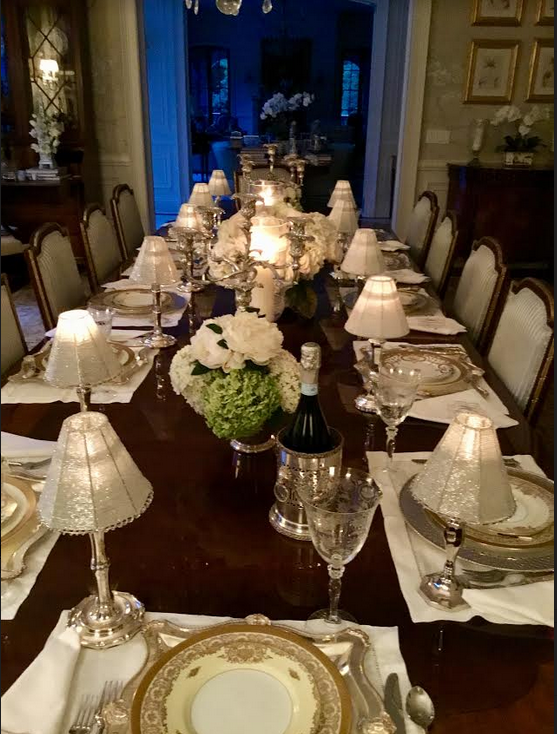 Nice to know others enjoy entertaining and using “the good china and silver” for dinner parties. The pheasant garden seat is beyond fabulous. Perfect as a side table. And I just adore the white mini foo dogs. So playful and they compliment blue and white so well. Wow, I guess it has been quite a while since I’ve visited your shop – so many beautiful things! I think my favorites are your silver bowls (oh, that lion’s head centerpiece bowl!) and planters, and the hurricanes, and your bell jar lighting fixtures are gorgeous. Your boxwoods are so nice, too! Tina, everything is beautiful what’s not to love! 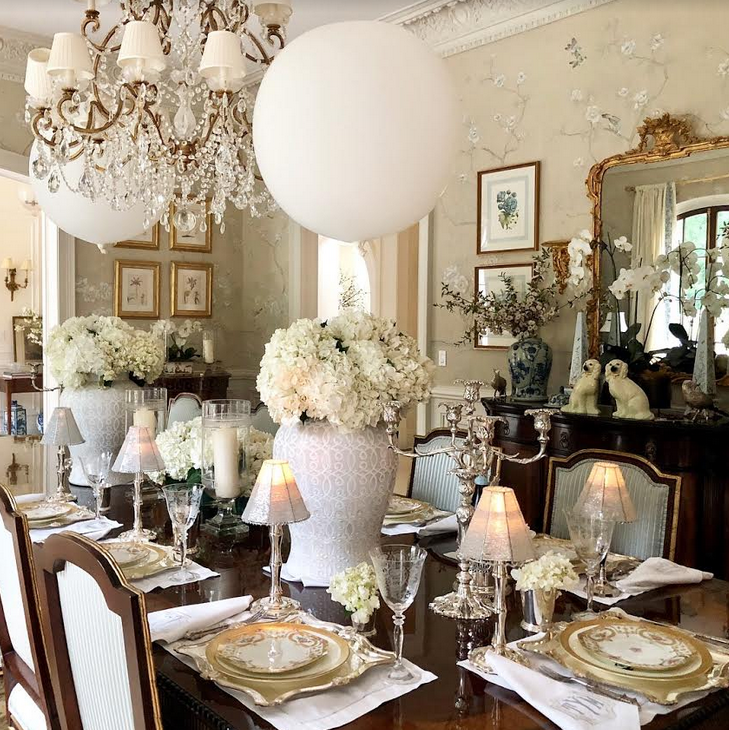 The topiary ,napkins , and the silver flatware is to die for. It’s so rewarding to love what you do. Enjoying what you do is not a job but a gift from God. Thanks be to God! I love everything but my latest wish is one of your tole planters as an elegant storage for dog toys!! I love so many things from your shop but I would pick the gorgeous bird & flower ginger jar. It would look perfect in my living room or main guest room. Thank you for all the beauty you bring into mornings. I, especially love Seven on Sunday. I love the silver dhargers and the faux topiaries. I can’t decide which styles to order, they’re all so pretty. I’ve been following you since early days when you were building your beautiful home. It has been fun watching you grow! I love the garden stool. Beautiful, and so functional. I really love the variety of beautiful porcelain and how you share your creativity in using it! Congratulations! Hi Tina, I was admiring and looking for the holiday wrap shown in your picture above (the cream-background wrap on the box underneath, the one with the olive green ribbon) yet didn’t see it in your shop. If you have any rolls left in your warehouse, I would be very interested in purchasing them! 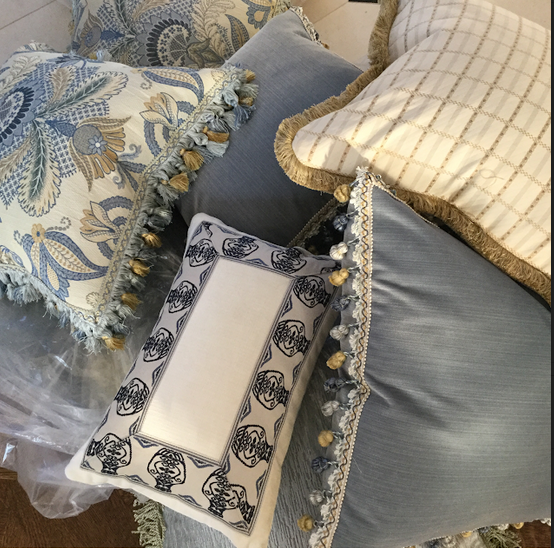 It is so wonderful to have your shop to purchase all things blue and white. 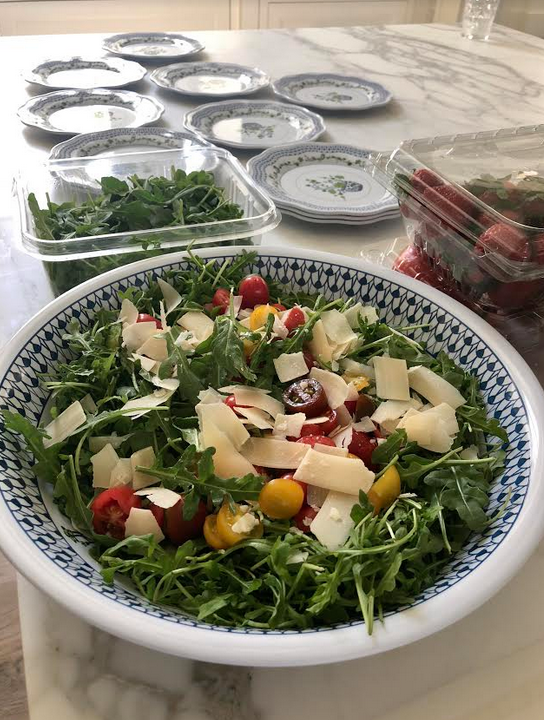 Love everything–especially the dishes. You are an amazing talent. Keep up the excellent work. There are so many gorgeous things! I do love the blue & white gourd lamp and the bird garden seat. 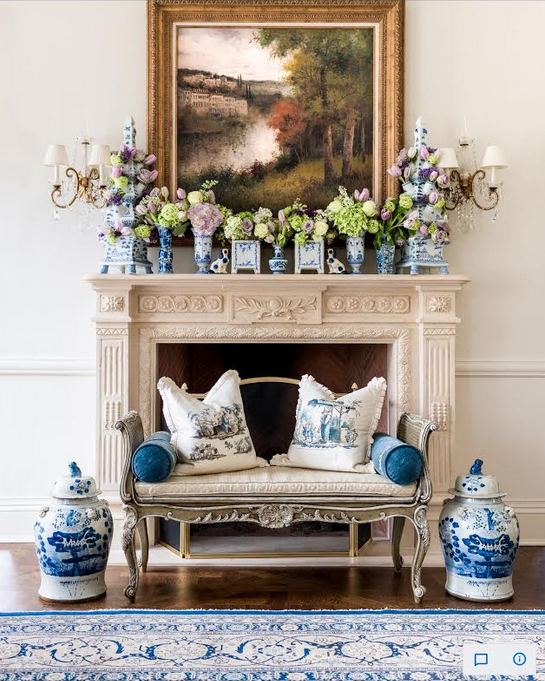 And although I am usually partial to blue & white, the chinoiserie ivory garden seat is absolutely beautiful. What beautiful photos and inspiration galore! I still think, in your free time, you should put a coffee table book together. 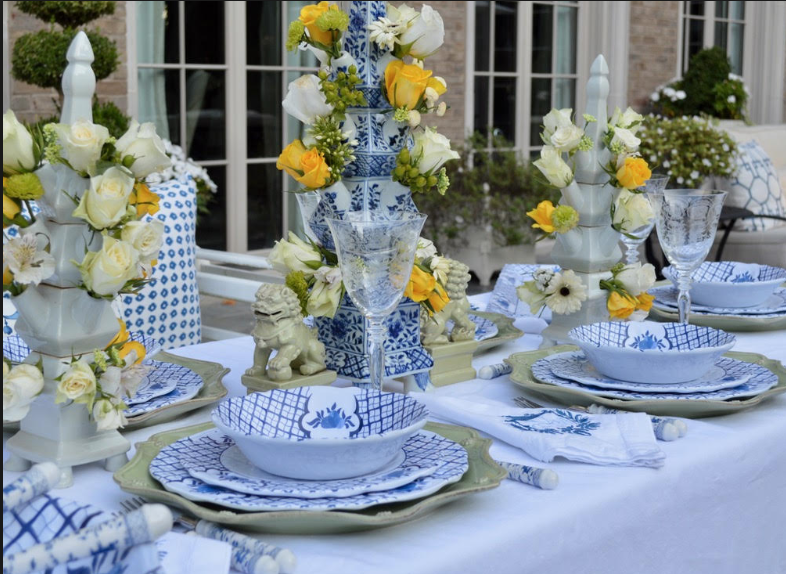 I especially like the blue and white porcelain bowl with the lemon topiary in it. I would probably put two on my kitchen island. Peggy E.
I love the big dog bowls and the beautiful green tray table. Love everything! 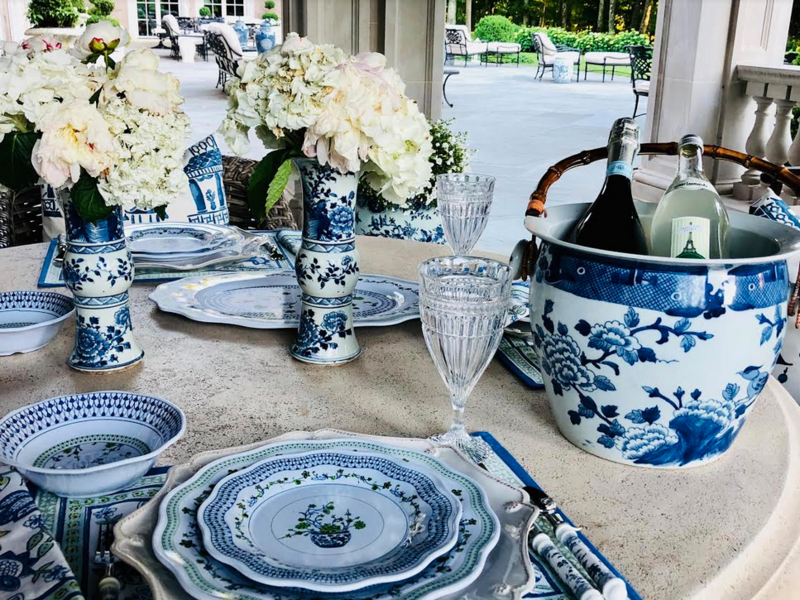 However the blue and white porcelain are still my favorite. The double happiness vase is just fabulous as well as the tea cady. Hope to have a collection of blue and white, it makes me happy! I have always had “visions” of beautiful decor. Thanks so much for sharing your wonderful gift of decor! I love the tulipieres! Putting them on my wish list! I visited your online shoppe and loved the garden seats and “everything” linen. Beautiful. Tina, first, I already follow you on Instagram! I also post your pics from time to time on my tumblr… giving you credit, of course! There is so much I love in your shop and I have purchased both blue and white jars, as well as some of your lovely silver pieces…and hope to purchase more! I just saw a beautiful Floral Ginger Jar and I also have my eye on your Large Flared Silver Planter… sigh. The bench has to be my all time favorite! Such beautiful, classic lines…it would “make” any outside area look fabulous, and I can see one inside as well. The tole trays, especially in ivory, are exquisite. Imagine serving flutes of champagne on one!! Your blue and white garden seats are beyond gorgeous. I’m also loving all your gift wrap! I’ve been eyeing the cache planter for some time. So unique and beautiful. Of course this is just one of many I’m drooling over. I love the ice bucket and the garden stools. Will be ordering both. What a wonderful and generous thing to do when one shares their talent , taste and creativity with others. Bless you and keep up the good work! No one offers the selection of ginger jars like yours. I especially like the one with the foo dog top. I have loved your blog for years!! I must say one of my faves is the beautiful wrapping paper that I use at Christmas…everyone who sees it loves it!! The tall lemon topiary in my favorite bowl makes me think of Colonial Williamsburg with fond memories of my visits there. Building an arrangement like this takes patience, not only to balance it but to make sure the florist picks are long enough. The first time I tried it, I had only toothpicks. The whole thing fell over. Lemons rolled off the counter and bounced around the kitchen floor. My cocker spaniel yelped with delight! ~ Jo S.
I love the tulipieres so much! Of course all your porcelains are fabulous! I love the chinoiserie garden seat. The pattern is lovely. I love ( and own ) the tuliperes and the gold tipped cache planters ! 😊. And want everything else … ! Your faux boxwood, life like orchids and hydrangeas are several of my favorites since I do not have a green thumb! Thank you for the chance to enter the contest. Laurie C.
Tina it has been so wonderful watching your blog grow into a powerhouse online store! I continue to be obsessed with your tulipieres and hope to someday soon purchase them. I also own your large Staffordshire dogs and absolutely adore them in my home! Every morning I get super excited to read your blog. It makes my day! I love everything about it…everything! You inspire me in everyway. I love your designs, your online shop, your energy, your talent, your passion for blue and white, all your amazing pictures, your recipes, your thoughts on the Florida Parkland shooting (Absolutely devastating. Your letter touched my heart), your floral arrangements, your trips to the market…seriously, I can go on and on. It’s impossible to pick my favorite, but since you ask…it would have to be the blue and white porcelain ginger jars. Sorry, I can’t narrow it down from there! 🙂 Your love for THE ENCHANTED HOME doesn’t go unnoticed by all of your followers! To your continued success! Thank you Tina! OK… here it goes…it is hard to choose which is my favorite because EVERYTHING that you make is BEAUTIFUL!!! I just purchased the Porcelain Trellis Garden Seat and when it arrived yesterday it is was even more gorgeous in person (did not think that was possible)! I just pre ordered the Porcelain Mid Size Trellis Bowl today. I can’t wait for this bowl to arrive so that I can plant fresh orchids in it! I have been eyeing your Porcelain Stafforshire dogs. I guess these are my top 3 favorite items. I love reading your blog and checking out your instagram account daily. Looking at all of your beautiful items is so inspirational. It is hard to narrow down my favorites to just one or two!!! 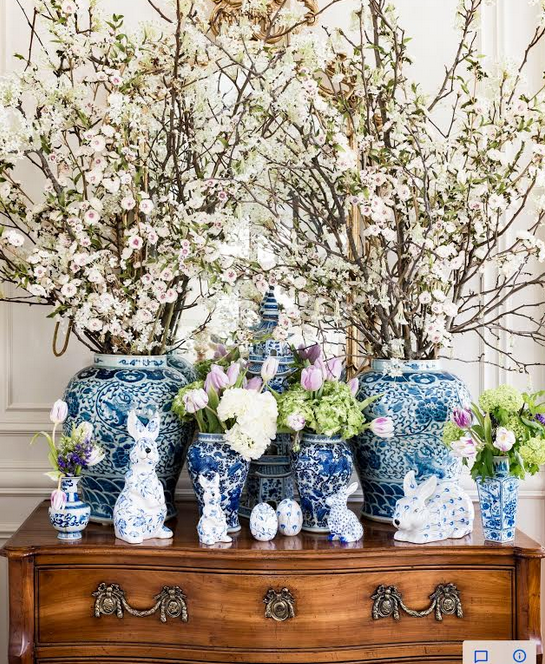 Your blue and white porcelain is hands down my favorite, especially all the lidded jars. I think your faux flowers are also amazing….I own several of your orchids and they are so beautiful. I love, love love the tulipiaries, & want a set of them. One of these days! Your tuliperes and garden stools are always my favorites among all your beautiful offerings! I love the tole planters in the restrooms. What a sense of satisfaction and accomplishment for you. Congratulations! I have to say I love the toile tray tables so much, especially the black! There are several spots in my home where it would fit perfectly! Also adore the chinoisserie mirrors and plan on adding one to my home soon! I look forward to your posts every day to soak in all the beauty. Absolutely love each and every item. Love the foo dogs. I love your fishbowl porcelain bowls! I imagine them in many ways on my deck! Toss up between garden seats & the melamine dishes! They are both great & hard to pick just one. The pink and cream hydrangeas in the cream/gold tole planter are stunning. Really good faux florals are difficult to find. I also love the pair of mini foo dogs in blue and white. They bring back nice memories if a trip to China. Cheers to you on making your hobby a wonderful career, Tina. Congratulations Tina on the success of your shop and all the items that you have created just for it. I love so many of your items, but I will give a nod to the extra large chunky gray and the white crackled jars. I know you have them on your sofa table at PB, and I love them. Also the white Staffordshire dogs and such a classic and the white elevates them in my opinion. And of course I follow you on Instagram too! Love the ginger jars so pretty. I am especially honored that you gave shout out to New Orleans locally owned Brennan’s Restaurant. As a New Orleanian it made me smile! Go Saints!!!! 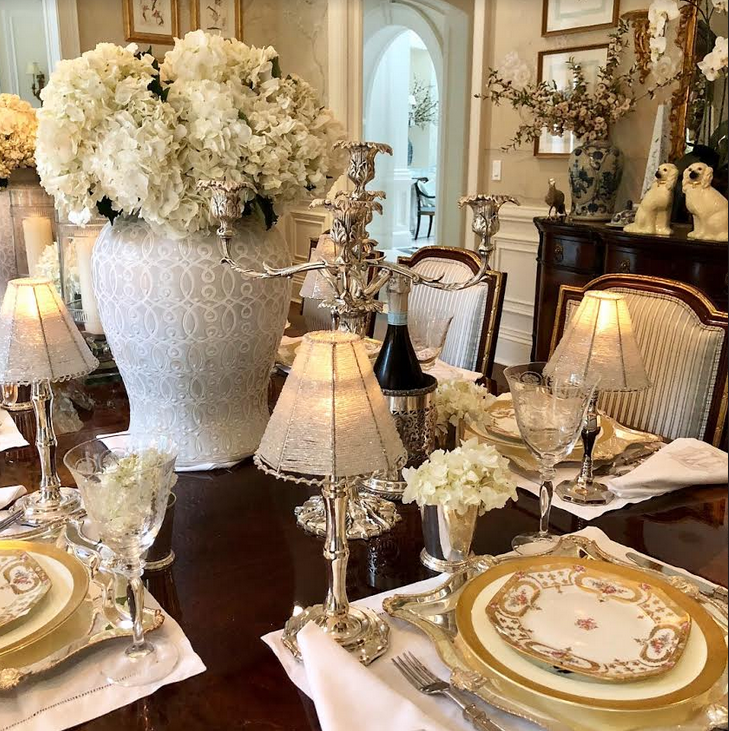 I love love the Gorgeous Embossed Lion Ring Centerpiece Bowl, and the Incredible Chinoiserie Ivory Garden Seat! So many things to love. I am loving your mini tea lamps. They would look great sheading light in my living room bookcase or on my dinning room table. That just might be my next order from you shop! I love your ginger jars and fish bowls! They are just beautiful,and I love seeing the exquisite ways you display them. True eye candy! My current favorites are the wonderful mini tea lamps that I admire each time I pass my dining room table, and the blue and white melamine with the touch of orange. So fresh and pretty! 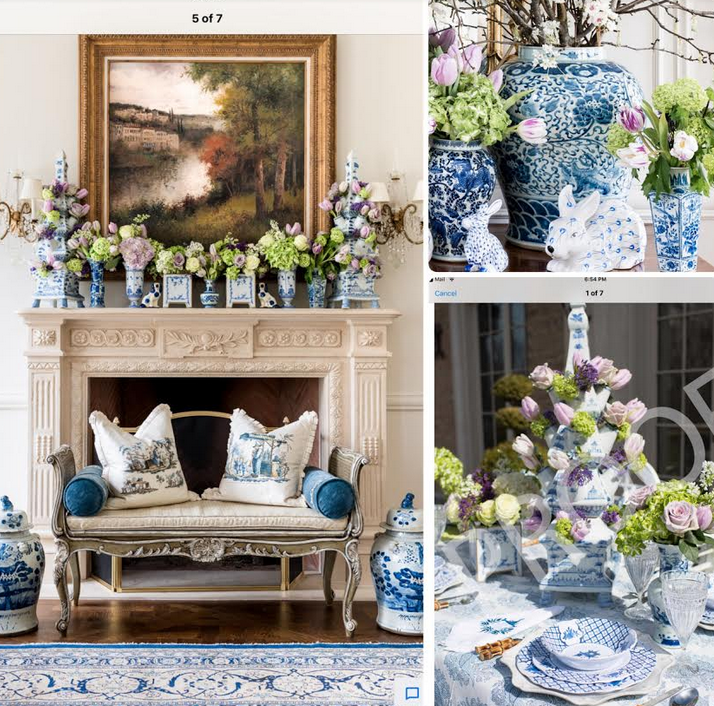 Really love it all, but those Chinoiserie pillows are gorgeous. Also the melamine is something I’d love to add to my collection! I’ve purchased your medium sized tulipiere and love it. Would love to someday buy a pair of pagodas ! Where to start! I love the celadon fish bowl with rings, the ivory garden seats as well as the boxwood topiary (what are the dimensions?). I started following you the first year you started the blog and remember being so excited when you offered the first sale of silver! You’ve also made a blue and white collector/lover out of me! I’m loving the porcelain bowls after seeing the large one you have styled in the PB house kitchen! I have made several purchases from your shop and am very please with the quality and service. I would love to own a large pair of blue and white ginger jars to go with the rest of my collection. I love the mid sized double happiness vase and the mini foo dogs! You are so blessed to be able to showcase your dreams and ideas. I absolutely love your pheasant garden seat and the beautiful tonal rug. I have just the rooms for both. Enjoy the last few weeks of this gorgeous summer. There are so many things to love and I love all o what I have purchased from your shop. I would like a set of the melamine dishes. They look so very nice and I can see them in my breakfast area and on the deck for al fresco meals. The silver is so attractive and I do enjoy the pieces I have purchased. Love your posts and your love of flowers! I purchase flowers every Friday; it just does something for the soul to see beautiful flowers and gardens. 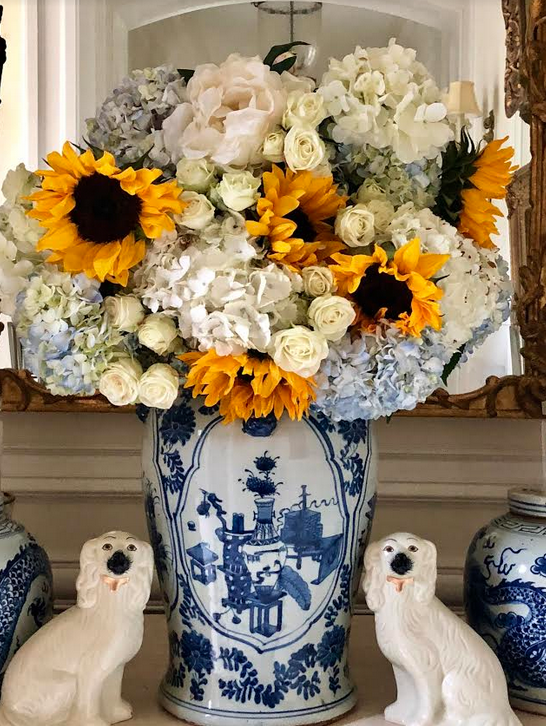 Joy C.
I’ve had my eye on your Provence Planters ever since you posted your first picture of your Palmetto Bluff home! As a fellow South Carolinan, those are right up my alley! Just amazing! 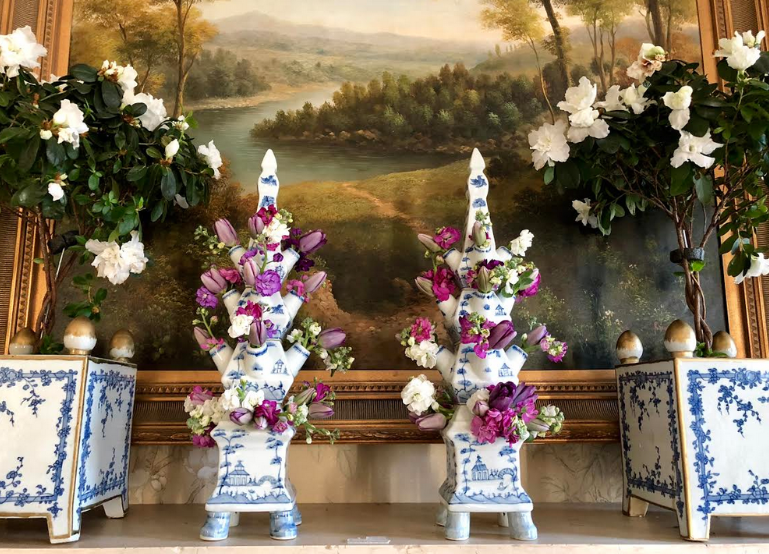 I love everything…..especially the ivory chinoiserie garden seat (just beautiful), and the orchids in planters are stunning! Cheers! What’s not to like? This is the best site!!!!! Your BEAUTIFUL items make the BEST gifts! Wrapping them in the GORGEOUS papers makes them extra SPECIAL! If you can conceive it and believe it……..you can ACHIEVE it. Best wishes for continued success and happiness! I love it all! My favorites are the flat tops and the silver candle lamps. So pretty!! Tina you most certainly found your calling, your collection is the prettiest out there period. I adore all of it and own many pieces. My next item on my list is a pair of your grand pagodas, they are so beautiful. I can see using them to flank my console in my dining room for the upcoming holidays. 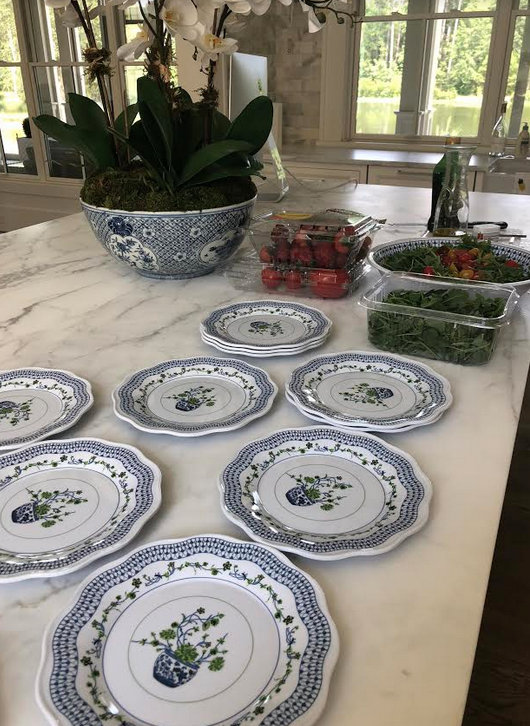 I got the Provence planters next month and they are even prettier in person as was the melamine. What can I say? You have it covered and I am in love with everything you dream up, so please keep on dreaming! I love the bunnies, the ornaments and the melamine…..all so pretty! Congrats on six very busy & creative years! So many wonderful things in your Shop, but I still come back to your wonderful Bell Jar lamps (my island is calling for two of them), and now that my family room mantle is finished, it needs a pair of the (statuary) pine cone topiaries. Could mention several other yummy items but you did say ‘two’…. You have so many beautiful pieces, it is hard to pick just one or two as my favorite. I do love the chinoiserie ivory garden seat and your tonal trellis rug. And, of course, I follow you on Instagram! I look forward to every post! Oh my goodness….I have just discovered all your beautiful things and am loving seeing how you pair them together. 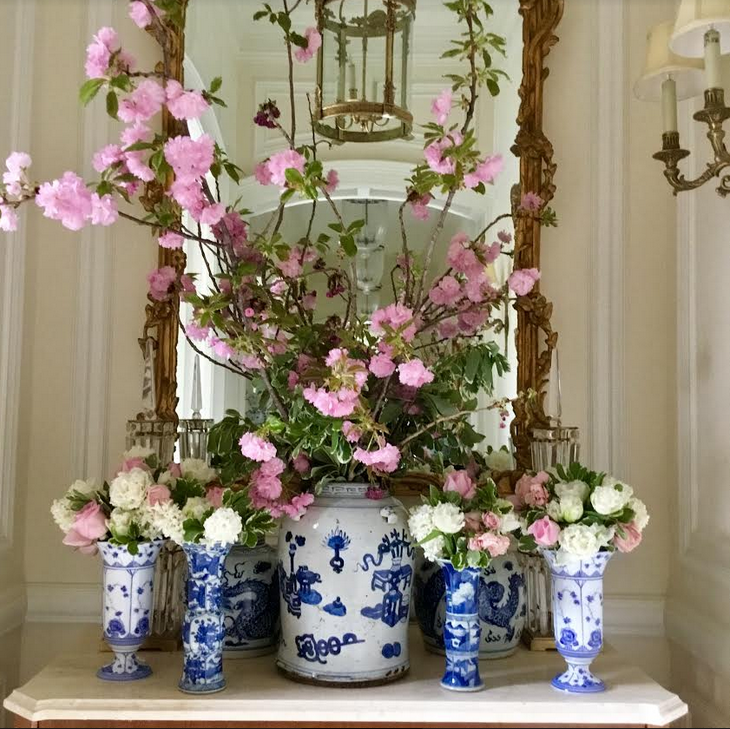 I am an oil painter and love capturing flowers in chinoiserie and am so inspired. I am in love with your bigger ginger jars. Also love the happiness symbol on things….makes me happy! I am going to add to my collection and love everything you have! Kathy C.
I love the solid what porcelain ginger jar and the white pagoda! Love the blue and white garden benches and topiaries. Your blog is such an inspiration to me. Never enough blue and white-true classic, goes with every color. Can’t wait to decorate with new purchases. I think I just want to move in to either one of your homes! I like the silver stuff and the oldfahioned rosebucet. I found your post just now as I’m sitting on my screened porch (blue, white and limy green) on this lovely summer morning. I was captured by the title “Celebrating What I Love To Do”. Yes, yes, yes! Tapping into our creative self and bringing beauty and fun into the world is a gift to us as well as those around us. Your porcelain pieces can be used by anyone to arrange a large or small vignette on a table that draws your eye. It doesn’t take a lot to make a room look special, just attention to detail. Timeless pieces, beautifully made, celebrate life and love. Congratulations and thank you.